Updated 11/23/2016 to include some observations. 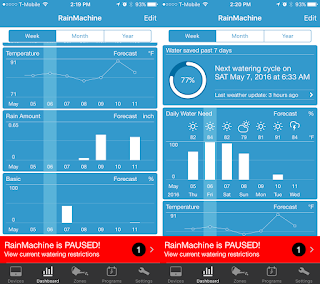 The RainMachine HD-12 includes a touch screen. Fancy. 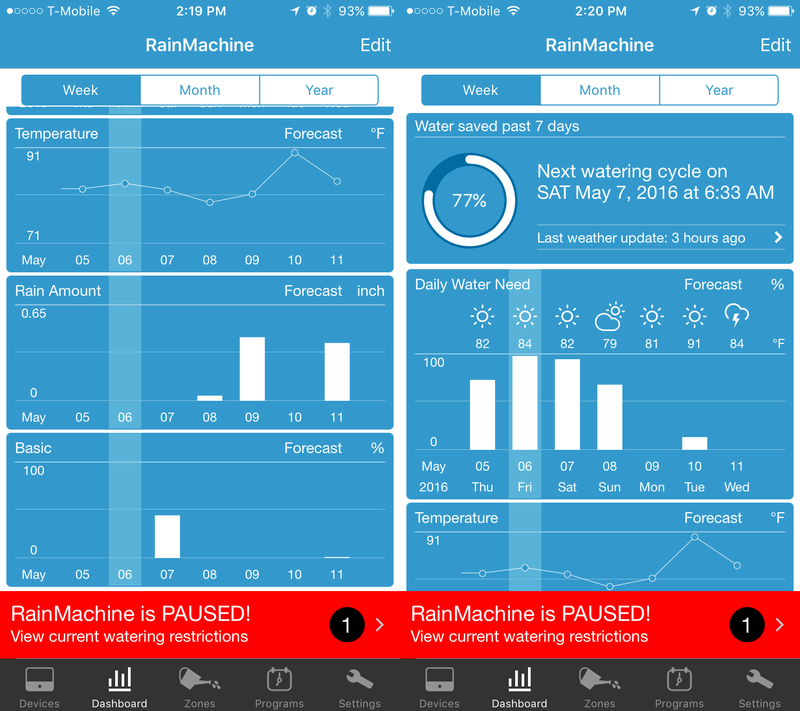 The idea with the RainMachine controllers (and several competitors, like the Rachio Smart Sprinkler, which I also considered) is that they are able to download meteorological data for your location and adjust irrigation rates based on what is actually happening and what's GOING to happen. Thunderstorms this afternoon? No reason to run the sprinklers. Raining in 2 days? Maybe you only need to run half the normal run time. On the surface this seems to be a very obvious use of technology. 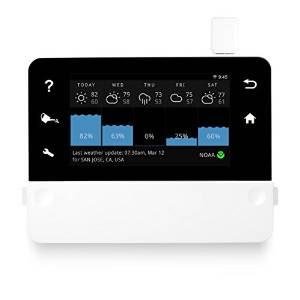 The RainMachine controllers come in 3 flavors: a non-touchscreen Mini-8, 8 zone controller, a touchscreen HD-12, 12 zone controller, and a touchscreen HD-16, 16 zone controller. I went with the 12 zone touchscreen HD-12. Why did I take so long to do this? Well, when we were renovating, they were selling the last of the 1st gen units and I wanted to wait for the 2nd gen. 6 months later they came out, but I just never got around to it. No more procrastination. Installation was a snap. I pulled the old unit off the wall, keeping track of all the wires that went to the various zones and the common wire, used the template that came with the rain machine to place 3 dry-wall anchors, and mounted the unit. I connected the included 24VAC adapter and each zone wire and the common wire and plugged it in. WiFi connection was made using the touch screen and an on screen keyboard. I let it select a few things, like my address, and then I then downloaded the iOS app to do the rest of the work from my phone, and later my iPad and the rainmachine.com web site. This is what was here when we moved in. Old fashioned, reliable, and now junk. Rain Machine the day I set it up. The first thing I did was verify that each zone was working. This was easily accomplished from the iOS app by turning the zone on and physically verifying that it came on. Next I copied my schedule from my old timer as a base schedule for the Rain Machine, and set up each zone for the appropriate type of watering, mostly "Lawn." One thing I did was enable the "Cycle & Soak" feature that reduces runoff by dividing your run time up and cycling through the zone multiple times to allow the water to fully soak into the soil. Currently I have 2 cycles, but I might tweak this later and enable more cycles. The way the program is set up, it knows that a full watering, if there is no rain, means running 2 cycles, 2 days a week. It can adjust from there. Next I set up restrictions. I am allowed to water on Wednesday and Saturday. It knows. I let it water above my schedule when the weather gets hot. My program starts at sunrise, but I told it not to water after 9 am, too, even though that shouldn't be a factor. Finally, I told it not to water when it's cold outside. Initial restrictions. You can restrict by temperature, month of the year, day of the week, and time of the day. After that, I tweaked a few other settings. We have clay soil so I bumped up my field retention from the base setting of 2 days to 3 days. This may be a mistake, and I'll know when it gets hot and dry, but I don't think it is. This will help avoid extra watering when we've had rain. I'll watch it carefully. The most difficult thing was adding Weather Underground data in addition to the default NOAA data (see the update at the bottom, but this is wholly unnecessary). I was required to register as a wunderground.com developer to get an API key. These things exist so that people don't abuse their servers, but it would nice if Rain Machine would reach some sort of financial agreement to allow all their users to use wunderground.com data. I understand that they don't probably feel like they need to with NOAA data available, but it would still be nice. There are actually a number of other options for weather services, some specific to regions or countries. NOAA and Weather Underground are the only ones I looked at. I got Weather Underground up and running, but it took a little extra work. Once you get Weather Underground up and running you can pick a site near you, but the map screen in the app needs some work. No water need until Thursday. Wednesday was a watering day, and I noticed it running Wednesday morning, which makes sense, because it's watering based on future need. It needed to cover the Thursday and Friday water requirements. As you can see, need isn't 100% for those days, so it ran shortened cycles on Wednesday. It only needs to water for Saturday and Sunday water need, not Monday and Tuesday. Interestingly, the forecast shifted a bit overnight and it ended up running even less. Right now I'm watching carefully, checking the night before my irrigation day and the morning after, and I like what I see. 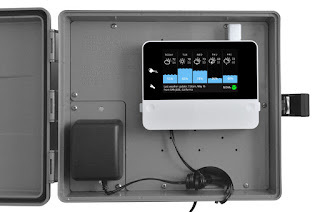 If your timer is mounted outdoors, Rain Machine recommends an Orbit 57095 Sprinkler System Weather-Resistant Outdoor-Mounted Controller Timer Box Cover. They do recommend that you not install with direct sun exposure, particularly on a South or West facing wall where afternoon sun will bake your Rain Machine. Instructions are provided on their web site. Just in case your Rain Machine needs to survive in the rain. After using the RainMachine all summer, the dent that it made in my water bill was enormous. I did a few tweaks to watering times in August when it was really hot and a few zones were a little under served, but mostly I just let it work. With City of Dallas water rates it paid for itself in the first 6 months. I would note that the Wunderground setup is completely unnecessary. I compared the Wunderground weather station performance to the NOAA radar estimate performance and found that it was pretty close in most cases. Additionally, at one point there was a multi-day power outage of my selected weather station and the missing data caused the RainMachine to become confused. The verdict: not worth bothering with.